Ideal apartment for a couple looking for a relaxing break. Lounge, one bedroom with two beds with an additional single folding bed available. Kitchen, bathroom, terrace, patio, pool. Just 60 meters from the sea and sandy Cala Mig cove. Coveta Fuma is a traditionally Spanish totally unspoilt village in a valley. It has a great village atmosphere with good local facilities in the local plaza/square including several bars, restaurants, children’s play area, hairdressers, post office, tram station and supermarket which is open 7 days a week in the summer season, are all within 600 meters walking distance of the apartment. It is laid back and peaceful but not remote. The property is fully equipped with all the basics required for a comfortable holiday. The terrace and pool area give all day sunshine, ideal for sunbathing, relaxing and alfresco dining. The lounge is nicely furnished and has a TV with UK channels and Spanish TV. The lounge is fitted with air con which cools the whole apartment and the bedroom has an additional ceiling fan. The kitchen has all you need for a self catering holiday and has a coffee maker, toaster, oven, fridge /freezer etc. A washing machine is available. The bedroom has two single beds and there is a z-bed available for a child or third person. There are several areas to sit and relax from the patio outside the apartment to the poolside and BBQ area, so plenty of areas to enjoy the al fresco experience. The apartment is in a cul-de-sac, so the area is very quiet and relaxing. It is on the ground floor and has only 3 or 4 steps to the garden and main entrance. There is off road parking for up to 4 cars. To the pool there are a few more steps as it’s on the upper level. The lovely sandy cove Cala Mig is only 60 meters away if you fancy a day on the beach and a swim in the sea. The apartment is fitted with smoke detector and there is also a safe on the premises should you require it. La Coveta Fuma and El Campello are situated on the Spanish coast between Benidorm and Alicante. These picturesque residential villages on the Costa Blanca, with extremely varied architecture in a landscape formed by hills, provide a panoramic view over sea and sandy beaches. This part of the Costa Blanca is also known as the 'Florida' of Europe because of its subtropical climate. So you can find Europe’s best climate two to four hours’ flying time from any European capital. And of course, all sports facilities, including 18-hole golf courses, are in El Campello and the immediate neighbourhood. The tram stop is a 650 meters walk away from the apartment which offers Trams to Alicante, Benidorm and Denia. 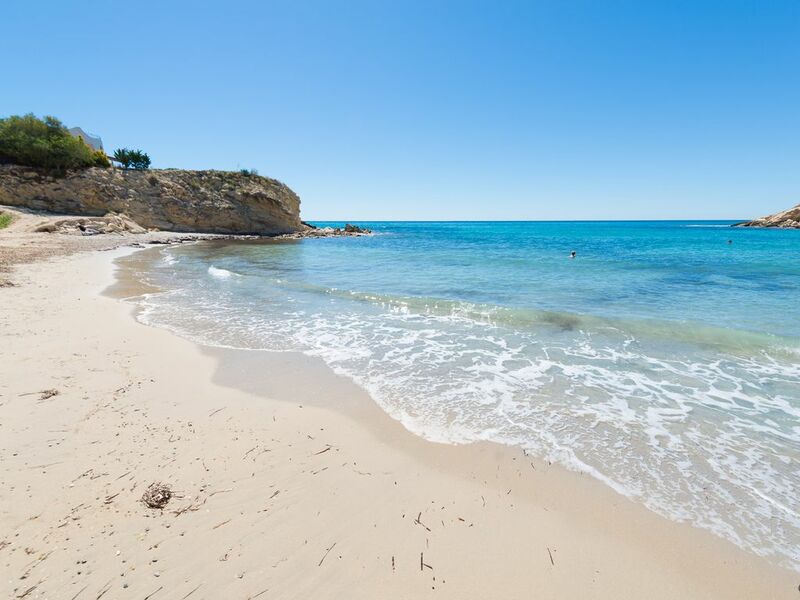 Just 5 minutes away by tram is El Campello, which is a lovely Spanish town with a long stretch of sandy beach, nice boulevard, great harbour and many little bars, terraces, shops and restaurants where fresh sea food is served. With 250 days of sun and an average summer temperature of 28ºC, in addition to 23km of coast, ranging from extensive sandy beaches to coves and private enclaves, Campello is an experience for all to enjoy. From swimming to sailing or just lounging in the sun, the activities are endless. For your safety there is a smoke and carbon monoxide detector. You can also have use of a safe if you require it. Loved the village! The private pool is a big bonus ! I and my two girls had a fabulous week in Coveta Fuma apartment, there is everything you need, very cosy and very private with our own pool! The local beach was steps away. The size of the pool is very generous, the property was clean and located a short distance to the tram which takes only a few minutes to ride to other towns, beaches etc.. Would highly recommend it!